Are you the stuff of legends, the one bards will sing about for years to come? Publisher's blurb: "Not all heroes are created equal. Many adventurers pick up swords or call upon strange powers in times of trouble, yet only a few are chosen by fate or the gods to change the course of history. These are mythic heroes - legendary figures whose every footstep shakes the heavens. 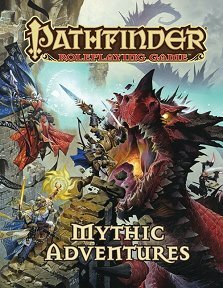 With Pathfinder Roleplaying Game: Mythic Adventures, it's your turn to change the world. Choose a mythic path and take on unbelievable powers by completing mythic trials tied to your character's story. Each mythic path works in parallel with your character class, allowing you to continue advancing in your chosen calling even as you seek a greater destiny. Best of all, you can start playing a mythic character at any point - even as early as 1st level!"